The camping didn't quite go as planned. This is my third trip Okanagan Lake Campground (North). It's a hard camp site to book (books up within seconds of becoming available) so I felt quite fortunate to get a spot anywhere in the campsite. 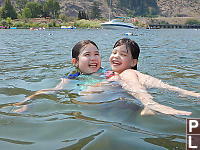 Our plan was to visit the Okanagan for a few days of sun, swimming and interesting activities! Our previous trips (2007 and 2009) were at the end of August (Labour Day Long Weekend) at the temperature was great. Today we arrived, unpacked into the campsite and immediately realized it was too hot to cook diner after a long day of driving. We went into Summerland and grabbed dinner in an air conditioned restaurant. We checked the weather - we were in for a week of hot weather - highs around 37°C, 10°C warmer than we were used to for summer. My kids are 6 and 8. Not every activity is kid friendly. Waking up at 4:30 in the morning and driving to a park for a walk before breakfast is a good example. I've seen White Lake on previous trips - it's a large (usually dry) lake about 45 minutes from our campsite. My plan was to get up and visit around sunrise. This is an arid area so the lake acts as a magnet for wildlife. I hoped that visiting early would let me see animals before they hid from the heat of day and I was immediately rewarded with brightly colored birds in the sage brush. I spotted a deer eating in the grass - it didn't seem to mind me walking by. When the Coyotes started calling, the deer definitely took notice. To me, they sounded like three distinct groups, but I'm sure the big ears on a deer are hearing things I'm not. I walked down to the lake to see how the shoreline looks, but the lake was actually really full so there was little to see. When we stayed at the Shuswap campground, we stumbled into a "Learn to Fish" event put on by Freshwater Fisheries Society of BC. The kids really enjoyed it last time and after a little digging, I found there was a "Learn to Fish" event in the camp site next to ours! We tried to bike over, but the trails were blocked by recently fallen trees. We had to drive over. They gave a good presentation identifying fish and discussing how to hold a fish to not hurt it. We practiced tying knots and then each family were given a rod and we went to the boat launch to try and catch fish. The kids had about an hour of casting and reeling in without much luck, but apparently one kid did catch a small fish. I am the first to admit this was a mistake. I have wanted to bike parts of the Kettle Valley Railway for a while and almost did a number of years ago until a forest fire burned much of the improvements made to make it passable. 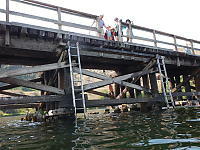 Amazing volunteers got the trestles and tunnels back into safe form and we drive up on a hot afternoon to go for a ride. The problem is the kids. This route is on the side of a canyon and it's quite possible to just ride off the edge of the trail and fall dozens of meters to your death. There are no guard rails anywhere and a 6 year old on a bike is a whole lot of random behaviour. It probably didn't help that I overheard people at the bike rental place talk about a mom going over the side because she was watching her kids instead of where she was biking. We biked a few km down the trail with the kids stopping frequently for water breaks a rests. My nerves were shot. The old rail bed is amazing. Trestles follow blasting as the route slowly winds it's way around the canyon. You can see clear across the canyon to trestles on the other side where the route continues. Building this route originally must have been phenomenally expensive. Even keeping the bridges maintained now must be quite pricey. After we biked down for a while, it was time to come back. I joined Claira's bike to mine and I towed her back on the slighting rising grade to the parking lot. Nara had drunk all of her water and complained almost continuously for the last 10 minutes until we got back to the car where we had more water. It wasn't the beautiful day I had hoped for, but it was still pretty amazing. When I was a kid, we visited a family that had a rock tumbler and a large supply of polished stones. It seemed like magic to me - somehow finding stones and then making them so pretty. My kids really like "Crystals" so I wanted to give them some idea where real people get them. With a bit of digging, I found someone to guide us on a day of rock hounding. Our first stop was an outcropping of rock was found durring a survey for a gravel pit and people have been banging on the rock for a while trying to harvest decent sized crystals. The kids got hammers and started trying to extract their own crystals. Further down seam (where you hung on with your toe nails) were larger crystals well secured in a bed of granite. We had hammers and chisels and we banged for an hour or two to find some crystals. We then moved to a second site. The site was a long drive up a gravel road where we found a rock face that had several deep fissures where people had previously mined common opal. There were wet seeps covering some of the rock and we immediately found frogs had taken up homes in the small pools where the water accumulated. When we stated banging, they left for smaller hiding places. The Opal is much softer than the surrounding matrix so it was easy to make lots of small (and sharp) pieces of opal. Removing a larger piece was quite difficult - you had to have a strategy and have patience. Our guide Tony was able to remove a fist sized piece by strategically hitting around, but I took much longer to remove smaller pieces. We had a great day! Thanks Tony for the help - we learned a lot in one day. It turned into a long day. We drove back to West Bank, grabbed some dinner and then started driving to our camp site. We heard there were some road restrictions due to forest fires, but the forest fires got more serious as we got closer. After we had stop and go crawled our way through peach land, I got out my tripod and started taking photos from the window of the car while we waited for the next time we would move the car up. After watching 3 movies in the back seat of the truck, the kids figured something was up. We got to the front of the queue and it was our turn to drive in a convoy down the highway past the forest fire. The Mount Enas forest fire had stated to burn down the mountain and it was getting close to the highway. Traffic was restricted to a single convoy at a time with police escorts and the front and end of the column. No stopping obviously. Our campsite was at the end of the restricted area and the entrance was a parking lot for a few police cars. Our campsite was under a mandatory evacuation order and we were given five minutes to collect our things before they kicked us out. We drove past campsites full of tents and RV's but no other people were left. We parked and loaded things as quickly as we could - sleeping bags and pajamas for the kids. Their stuffed animals. Bathing suits. We didn't have enough time to get bikes or stoves or much of our stuff and it was time to go. Thankfully my parents were staying with friends about 45 minutes away and we were invited over. At midnight, with some still excited kids, we rolled in and got the kids ready for bed. What do you do with tired kids and most of your stuff missing? We went to the beach! We drove down to Okanagan falls and lets the kids play in the lake while we messaged the campground operator and read every piece of information we could find on the internet. The highway was open then closed then open again but the camp site was no entry. It seemed unlikely it would open so we enjoyed our day in the sun. We found Tickleberries Ice Cream and enjoyed their air conditioning. They have a great business model - large portions of ice cream served in a very warm climate and an air conditioned store full of knick-knacks and other vacation trinkets. My wife bought a purse. We came up with a plan - my parents took the kids home and Helen and I would wait until the camp site opened again. The next morning the kids left and the Park operator told us the camp site might be open from 12 until 3pm to remove items, but was still under an evacuation alert (you couldn't stay). When we arrived at noon, the police required ID enter and your name had to be on the reserved campsite list. It took us roughly an hour to pack. Some things had been blown around and our tent had collapsed in the wind but we were otherwise fine. Nothing was missing, but the camp site was eerie quiet. There was a thin layer of ash on things and everything smelled of smoke but otherwise no damage. We had a long drive back to Vancouver and with the highway closed we had to go the southern route. 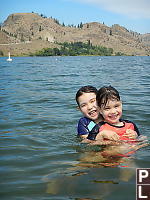 We stopped in Keremeos to pick up fruit and then drove though to Vancouver. We wound up having dinner at Rangoli at 11pm. It was a shorter camping trip than we were planning but we still had a great time. Thanks to Maria for hosting us on very short notice!